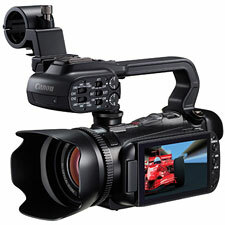 I am revising my opinion of Canon's XA10 professional HD camcorder—upward. Interestingly enough, I've revisited test footage of the XA10 as part of a comparison with a newer camcorder, and...I have to say I like the XA10's footage a lot better. Why the change of heart? In part, it's because I initially mis-processed XA10 footage in my editing software. That's an easy mistake to make: the XA10 shoots progressive footage but encloses it in a standard 60i AVCHD wrapper. If you're not careful, your editing software can easily mistake the footage for actual interlaced video, consequently doing subtle but noticeable damage to image quality. Processed correctly (that is, with the fields combined correctly without deinterlacing), XA10 footage compares very favorably with TM700 video—a current prosumer favorite. While the XA10 sits clearly within Canon's professional camcorder lineup, its design is closer to a consumer camcorder than a broadcast camera and thus 'friendlier'. The XA10 offers a familiar look and a simple interface for those coming from the consumer/prosumer realm, in a compact package ideally suited to documentary/run-and-gun videography. If you're going to be spending the money on an XA10, however, which will be typically double what a top-of-the-line consumer model will cost you, you're going to be expecting not just a compact body with a pro-grade feature set, but also professional-grade image quality. In this regard, the XA10 is not a slam dunk, but still a respectable accomplishment. In terms of pure sharpness, Panasonic's TM700 does offer more resolution, but subjectively speaking, no one is going to pick TM700 footage when compared head-to-head with the XA10. The Canon shoots a bright, contrasty, and color-balanced image, with excellent dynamic range and gorgeous midtones. Why is the TM700's picture sharper? Because the XA10 uses only a single 1/3" CMOS sensor, whereas the TM700 uses three sensors, one for each color. The single-sensor Canon must thus interpolate color from its native 1920x1080-pixel chip, necessarily reducing actual sharpness. That said, with the XA10 you get a very good lens with a nice wide (31mm) angle of view, in a very compact and light package (by pro video standards). I was bothered a bit by the XA10's autofocus performance. In a variety of shooting situations, the focus seemed to miss every now and then, visibly taking its time to get it right—even when a face was clearly visible in frame. I wonder if this is due to the XA10's single sensor, and reduced absolute resolution. I like the XA10's image stabilizer a lot, but the stronger (and thus more useful) setting does interfere with panning, as it causes a visible 'jump' at the end of any deliberate camera move. Ultimately, I have to say I'm still waiting for the day when we get a three-chip professional camcorder that is as compact as the XA10. That will be a happy day indeed for those of us who carry video cameras into the backcountry. For now, however, this is a credible choice for run-and-gun shooters, offering compact size plus picture quality that is certainly more pleasing than TM700 footage—if just a hair less sharp.